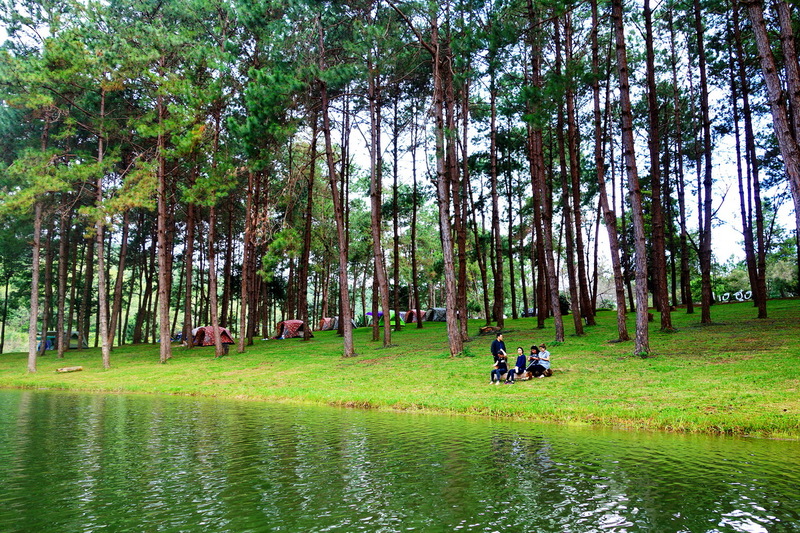 Pang Oong is a mountain reservoir surrounded by pines and is approx. 500 metres from a Ban Ruam Thai (Shan village). Pang Oong or Pang Ung is a recommended destination if you take a trip to the north. 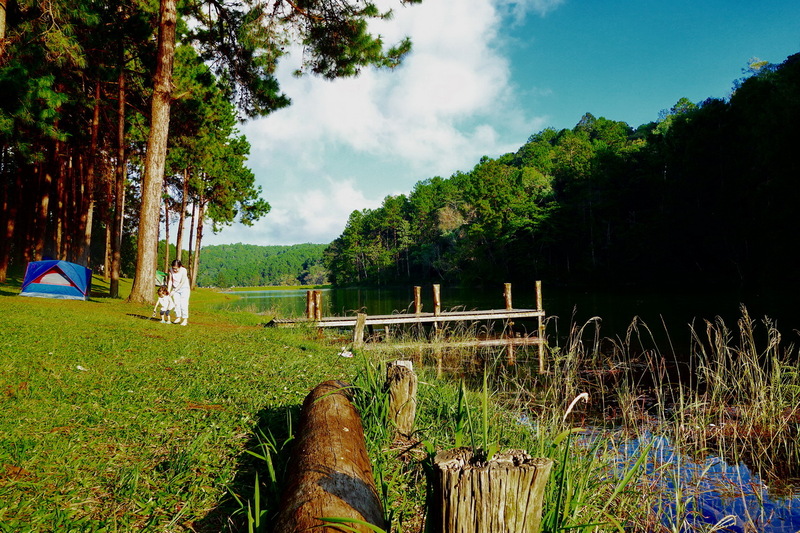 Pang Oong Park, established in 1984 under the Royal Project, is known for being an eco-travel destination, where you can spend your time relaxing under the pine shade that surrounds the large reservoir. Taking photos of Pang Oong’s most romantic scenery is another popular activity because around every corner is an opportunity for a nice shot. 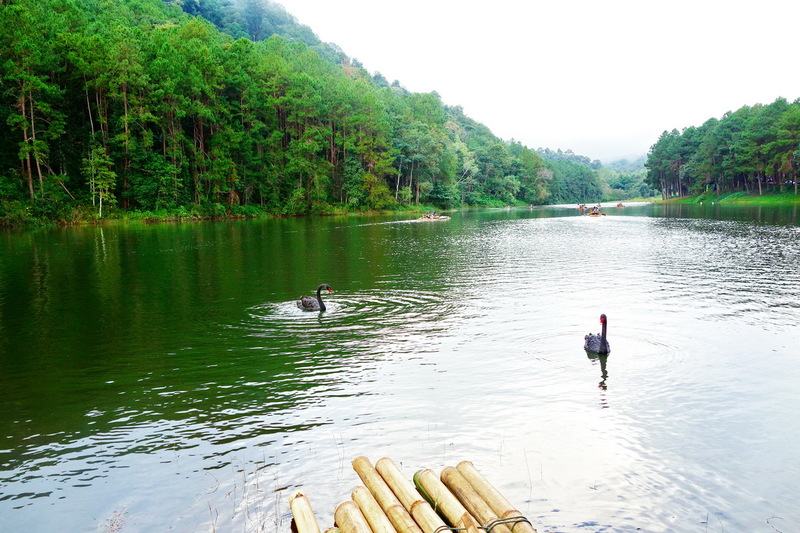 Staying overnight is recommended when visiting Pang Oong in order to appreciate the morning scenery of the sunrise above the reservoir shining its golden rays through the mist about the water’s surface. Pang Oong is beautiful in every season but the most crowded is the cool season. 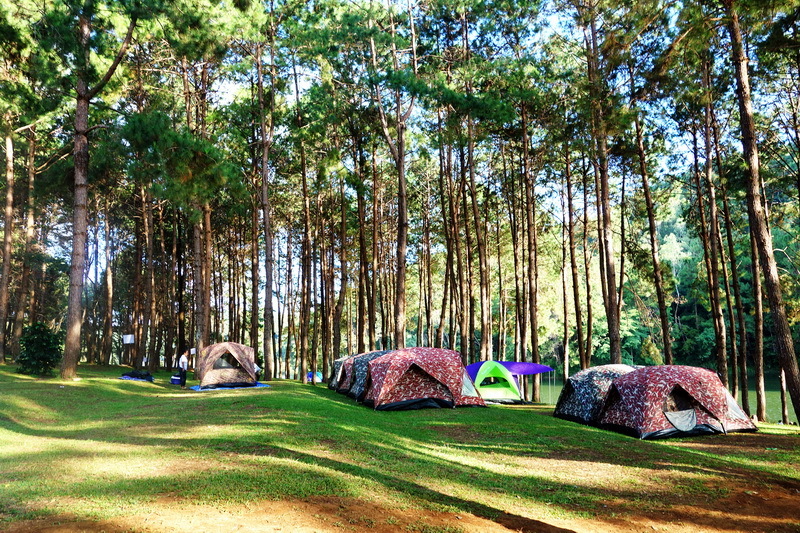 There are camping areas and rented houses, but during festive and high seasons you are recommended to make a booking for accommodation in advance. The atmosphere in the cold morning making Pang Ung become a tourist attraction. Most Popular romance top of the Son and has been dubbed as the “Switzerland of Thailand” will reflect the sunrise over the water grasslands. And a thin mist Paramount Pictures impress unforgettable. Even though the fog disappearing, it is still a beauty. This phenomenon only happen in the winter months between November to February. The one meter fog will gradually move in to cover the lake like a blanket. The rising of the sun also give the fog a significant interaction and bring the whole scene alive with movement. The lake is the local reservoir for the town Ban Rak Thai and the town isn’t really Thai at all in fact it was founded by Chinese so if you can read Chinese it’s a piece of cake most of the signs are in Chinese. There are bamboo rafts on the lake that you can rent out and even a horse you can take for a ride. 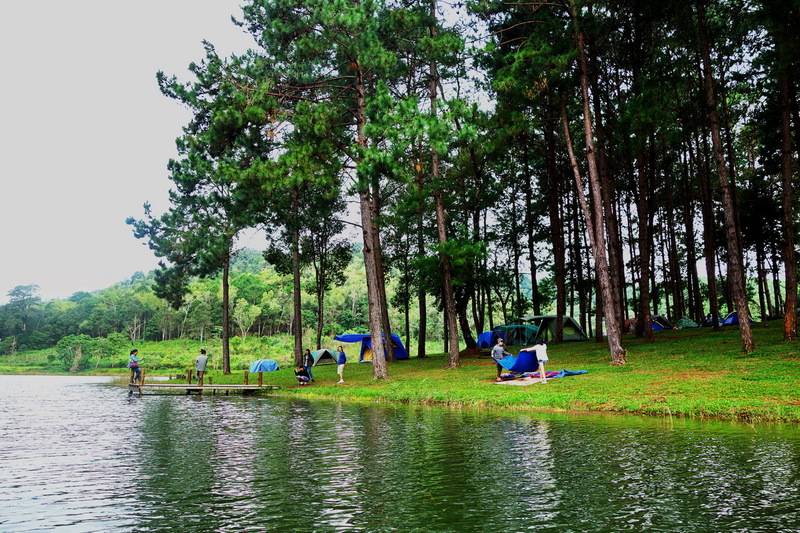 There is also camping and bungalow accommodation near the lake. All visitors planning on camping out at the Lake must report to the visitor control centre to purchase a camping permit. The cost is 100 Baht per tent but that’s fine because they do take care of this area. There are many more attractions along the road up to Pang Oong. 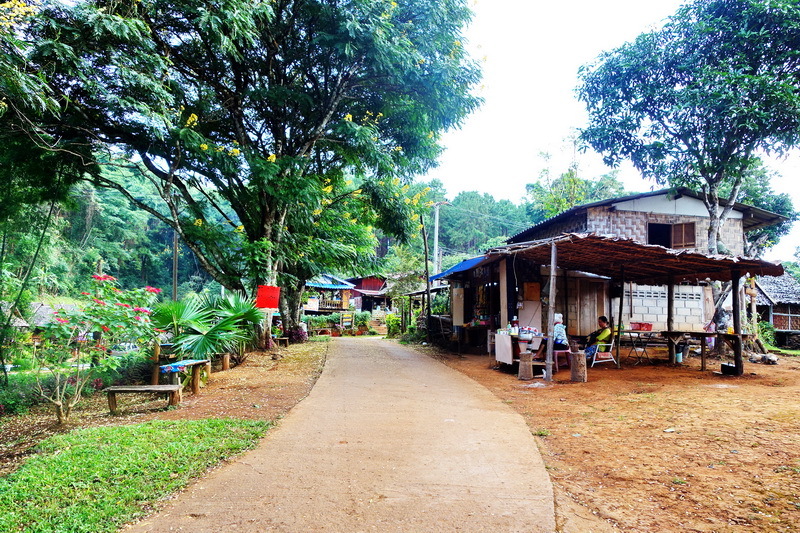 Baan Rak Thai is a village nearby Pang Oong and is the last village before the Thai- Myanmar border, around 44 kilometers from Mae Hong Son, whose villagers are mostly Chinese immigrants who moved from South China many years ago. The village is notable for its tea and wine industry and you can see how the tea is grown and harvested here, and taste some delicious Oolong tea; an annual Tea Tasting Festival is also held at Baan Rak Thai every February. Not far from the village is Pha Suea Waterfall, a beautiful spot for taking photos and trekking during the rainy season. If you feel exhausted from a long trip, stopping by Phuklon Country Club may be a good idea, because you can get face and body skin treatments using mud from a natural spa rich in minerals. Fish Cave or Uthiyan Tham Pla a small, relatively unknown national park by Highway 1095, around 17 kilometers from Mae Hong Son City, is a nice resting area because of the many Thai, northern and local food stalls and restaurants located here. At the mouth of the cave natural springs from beneath the mountain create a pool in which many large fish live. There are many different kinds of trees and plants around the cave in the area of the national park and a small river with such clear water you can see the sand at the bottom. How to get there : The route from the town of Mae Hong Son – Pang Ma Pha, about 10 miles, turn leftthrough the same route to Phu Pha mud mat. Pang Tong Palace. Go to my notice thesmall sign to turn left to write that “the home of Thailand”, turn left. Over the eggplant, orange and Huay Ban Pang Ung, including Thailand, or the path of the curve is steep andnarrow streets. Sometimes, there is still an obstacle. It should travel during the day. If traveling by bus up to the market town of Mae Hong Son The bus to Pang Oong at 09.00am and 15.00 pm and from 5:30 am and Pang Oong at 11:00 am It takes about 2 hours.